Just to give you some perspective, the average restaurant-serving-sized lobster is about 1.5-2 pounds. 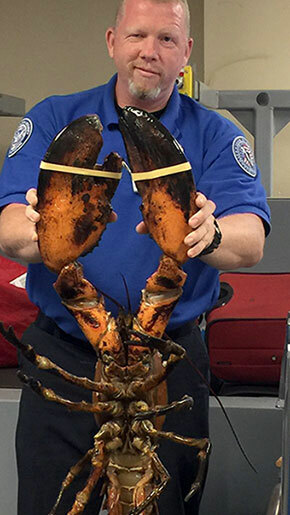 So imagine the surprise of a BOS TSA agent when he found a 20-pound crustacean in a passenger’s carry-on bag. TSA spokesman Michael McCarthy told The Boston Globe that the jumbo-sized lobster found by the agent was the "largest" he's ever seen. Hard to dispute – check out the photo, the claws are as big as the guy’s head. Big or small, the tasty crustaceans are allowed to be taken through security. “I cannot speak to any airline policies, but TSA has no prohibition on transporting lobsters,” McCarthy added. “It’s actually fairly common in the New England region” – as it is in Canada’s Maritimes. Still, just as with liquids, lobsters must be packed appropriately. The TSA specifies that live lobsters must be transported in a "clear, plastic, spill-proof container." The agency also advises fliers to check with their airline about individual carry-on policies. "I would be shocked if this isn't the biggest lobster TSA has screened, although I can't say for certain," McCarthy told NPR.